As a good hindu girl, I shouldn’t really eat steak. But as a self proclaimed foodie, I was hooked from the second I was force fed my first bite! My love of steak is quite precise, it has to be either in a salad (oriental in particular) or as a chunk of meat (minced beef doesn’t appeal to me, so no bolognese or cottage pie etc) and my preference is medium rare – so pink (I am a girl after all!). My favourite steak house is Gaucho..its the Churrasco de Chorizo for me (that’s the spiral cut piece that’s marinated for 48 hours..mmmm!!) 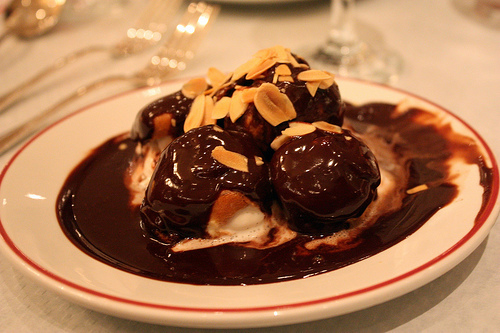 But on Saturday night after hearing rave reviews, we ended up at L’entrecote. This French steakhouse is extremely popular because 1) u can’t book a table 2) there’s always a queue (thus enticing others to join) and c) the secret sauce. With branches in New York, Paris, the Middle East and London to name but a few, its obviously doing something right! After pulling up 20 minutes late, we found the boys in the queue already..there were a good number of people in front of us, but a further 25-30 minutes later (might have been 40 even) we were finally seated – right after a gobby bunch of Essex Girls who made for entertaining people watching. When we asked the waitress what was the secret of the special sauce..she said “if I knew that, I wouldn’t be working here, I’d have my own restaurant and be serving steak with special sauce there” – slightly bitter me thinks!! We went ahead and stated how we’d like out steak cooked and off she went to prepare our order. Whilst we were waiting, Mr L filled us in on a bit of history. 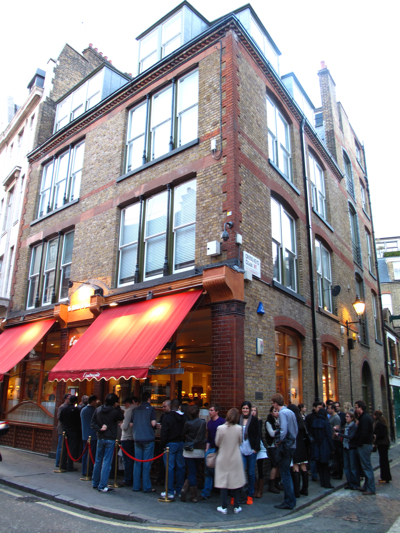 Apparently the originator had owned a winery and was looking for an assured way to sell his wine so he bought an Italian restaurant called ‘Le Relais de Venise’. He decided on a traditional French Bistro menu of steak and chips with a salad for starters then a selection of deserts consisting of ice cream, chocolate, whipped cream and meringue. This concept clearly still exists. Just as Mr L completed his story, our salad arrived. As a fan of all things mustard, I was extremely satisfied with my salad. 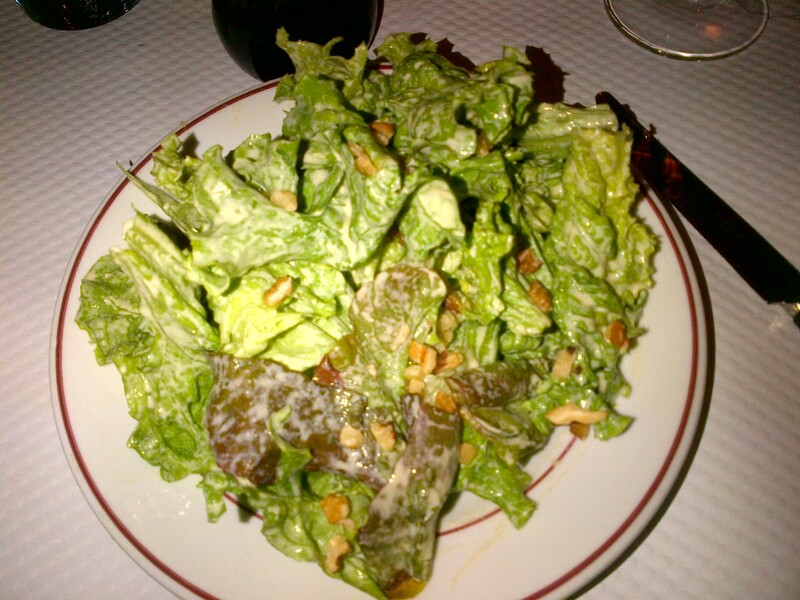 It consisted of mustard vinaigrette dressed lettuce leaves topped with walnuts. It was simple, but the mustard gave a wonderful depth of flavour. Whilst some may think the leaves were slightly soggy, I would call them well dressed, overall the perfect starter. Along with our salad we were served french bread (no butter). We then waited for our steak, which took barely any time at all. 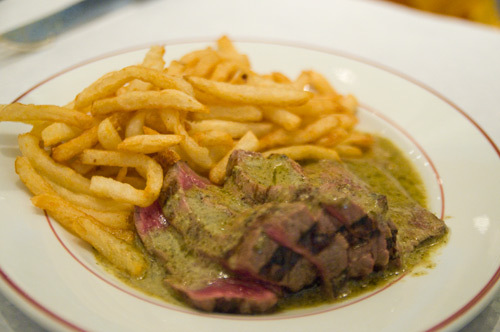 The beauty of L’Entrecote which is unseen in other restaurants is that the steak is served in two halves. This not only ensures that your meal is consistently hot, but you also have enough of the ‘special sauce’ to douse over it. As I’ve already said, my preference when it comes to steak is medium rare, so the face that this was served medium meant that it didn’t melt in the mouth so much + was a little bit chewy. The chips were thin and crispy as traditional ‘french fries’ should be and the special sauce added a nice flavour, altho we all agreed that there was an underlying indian flavour, a little like green chutney. Just as we finished the first round, the second was served, however the overall size of the steak can’t have been too large based on the number of slices served, so there was most definitely space for dessert. After much pondering (and googling) we decided on the profiteroles (which to my disdain were ice cream filled rather than cream filled – however this in no way deterred me from eating them) and the Gateau du Relais (when I googled this it told me it was the relay cake – made no sense until I realised that the restaurant is ‘le relais de…). The desserts arrived in record timing and whilst the relay cake (!!) 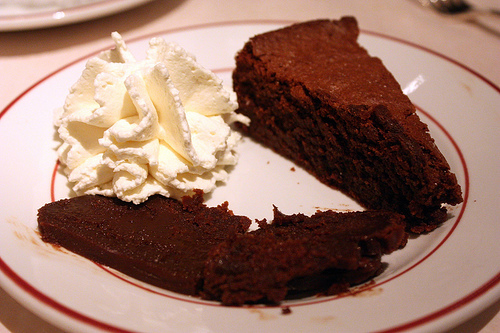 consisted of a slice of chocolate torte which had it been slightly softer, would have been a lot nicer and a slice of what can only be described as chocolate terrine, the profiteroles got the winning vote in my book! Been thinking of going here for a while now – but feeling a little put off by the pictures – was it actually tasty? Who want their steak sliced for them?!?! The steak was good, but I js felt that the Gaucho one is a better flavour. The sauce does add extra flavour tho. People have been very complementary about it, I’d say give it a go, better to try everything once then not at all right!